Please sponsor the event, buy your tickets now. 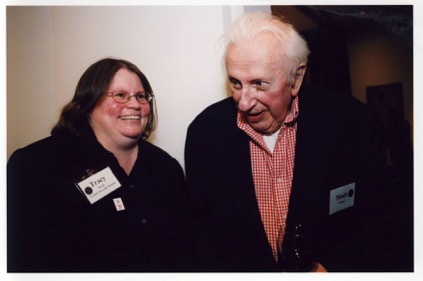 Studs Terkel was not just a name to us, he was a mentor and a guiding star. In fact, Louis B. 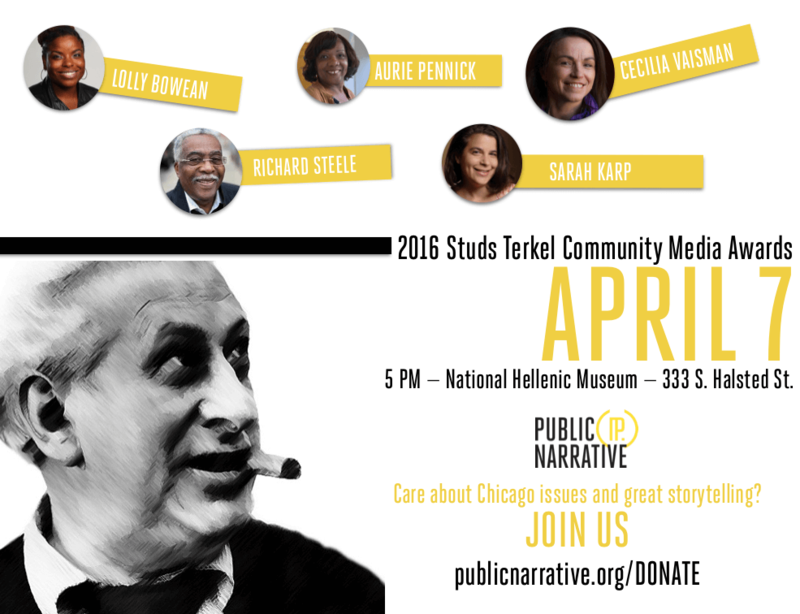 “Studs” Terkel was our patron saint from the founding of the organization in 1989, until he died in 2008. 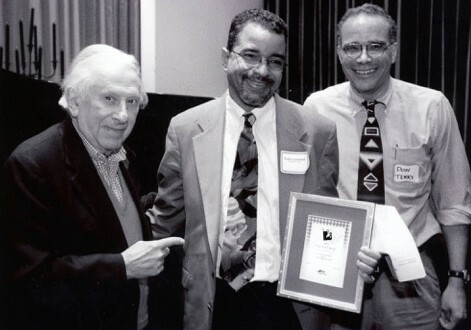 Curtis Lawrence, then of the Chicago Sun-Times, now at Columbia College Chicago, and Don Terry, of the New York Times — two Studs Terkel Award winners, celebrate with the man himself. For years, Studs Terkel chose the journalists who would receive this award. And for years, he gracefully and graciously led the annual tributes to the special kind of Chicago journalism these men and women excel at doing. For years, he closed the ceremony, leading the crowd in his favorite song, “This Land is Your Land,” by Woody Guthrie. Today, the Terkel Awards are chosen by the men and women Studs’ singled out, a committee of past Terkel Award winners. Presented annually, we honor outstanding media professionals for excellence in covering and reflecting Chicago’s diverse communities. These reporters, editors, producers, videographers and photographers take risks in covering social issues by offering new or unusual perspectives, from housing to race to violence to health to education and beyond. The awards are given for a body of work rather than a single article or series, and go to journalists at any stage of their career. 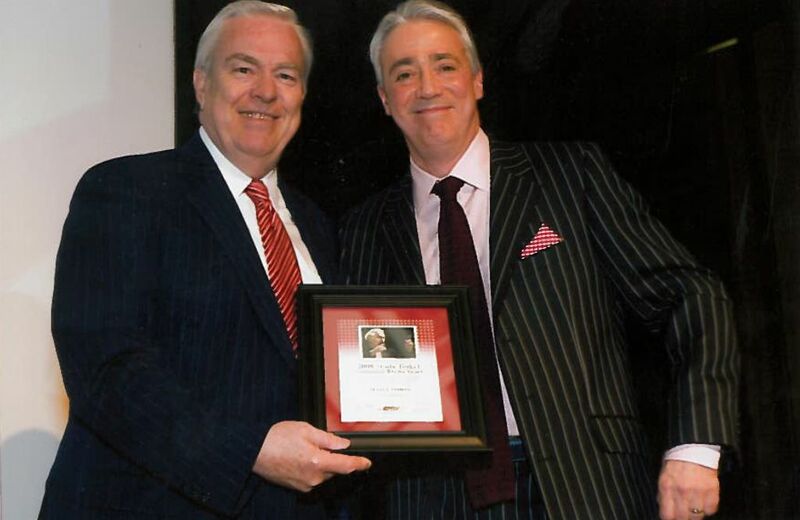 Bill Kurtis presenting Scott Simon with his 2009 Studs Terkel Award. On award night, we also recognize promising student journalists at Columbia College Chicago, home to Public Narrative. Plus, we single out and give thanks to special philanthropists, who understand how important our work is to this city with the Uplifting Spirit Award. It’s a fun night to honor the Fourth Estate — but it is also a significant fundraiser for all our events and program at Public Narrative, where we teach and train journalists and nonprofits to tell better stories. Tracy Baim, of Windy City Media Group and a Studs Terkel Award winner, with Studs. Alex Kotlowitz, author, filmmaker and radio journalist, and Rick Kogan, of the Chicago Tribune and WGN-radio, — two Studs Terkel Award winners. Studs with four Studs Terkel Award winners; Laura Washington of The Chicago Reporter; Jon Anderson of the Chicago Tribune; John White of the Chicago Sun-Times and Harry Porterfield of WLS Channel 7 News. Cheryl Corley, of WBEZ, receives her Studs Terkel Award from Studs.